A biography of Abd al-Qadir al-Jaza'iri is subtitled 'A story of true jihad'. So it is surprising to find that a town in America's Midwest, the region that led America's swing to the right in the 2016 presidential election, is named after a Muslim freedom fighter. But Abd el-Kader, to use the popular transliteration of his name, was a freedom fighter who won global approval. His interpretation of jihad was based on the Quaran - 'Let not your hatred of other men turn you away from justice. Be just…that is closer to piety' (5:7) - rather than the perverted interpretation adopted by those who have sullied the Muslim faith. Abd el-Kader was born in Guittena, Algeria in 1808. His father was a was a shaykh in the Qadiri Sufi order and while in Damascus Abd el-Kader was initiated into the Naqshbandiyah Sufi order. As part of its colonial ambitions France occupied Algiers in 1830 and established a strong military presence. The alienated Algerian populace elected Abd el-Kader's reluctant father to lead a jihad against the occupiers, and the ageing Sufi marabout immediately delegated this responsibility to his twenty-four year old son. Abd el-Kader attracted global attention not only because of his unprecedented success on the battlefield, but also because of the humanitarian ideals inspired by his liberal Sufi faith. He engaged in truces and prisoner exchanges whenever possible, with his treatment of prisoners being interpreted as a quaranically-inspired forerunner of the Geneva Convention. Following his success on the battlefield he retreated to Damascus, where he is credited as saving thousands of Christian lives in the 1860 Turkish pogrom. Pope Leo IX and Queen Victoria were among the heads of state who praised his interventionist role in preventing a religious genocide. In the photo above Emir Abd el-Kader is wearing some of the decorations awarded to him. Abd el-Kader's exploits resonated particularly strongly with Americans who had themselves engaged in a struggle against a colonial power. President Lincoln acclaimed Abd el-Kader as a great humanitarian for saving Christian lives, and when the Sufi freedom fighter died in 1883 the New York Times eulogised that "The nobility of his character won him the admiration of the world. He was one of the few great men of the century”. When a new town was planned in Clayton County, Iowa in 1846 the civic leaders named it Elkader after the young Sufi who was then engaged in resisting the French subjugation of Algeria. 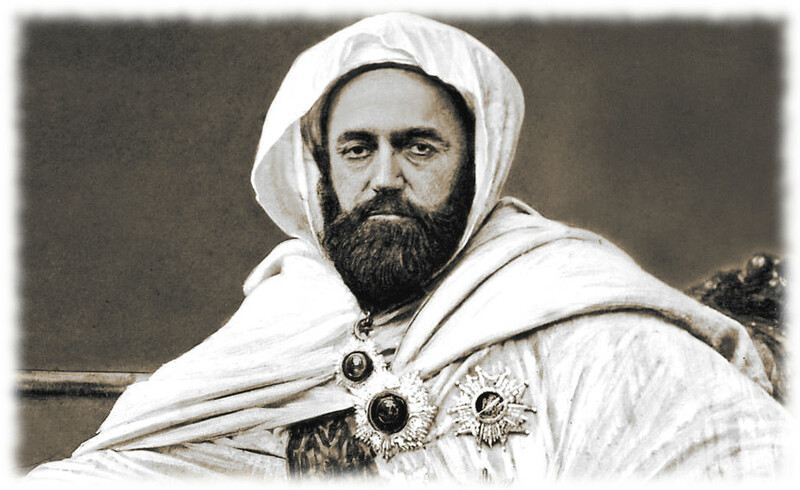 Today Elkader is the home of the Abdelkader Education Project which develops educational resources and opportunities for engagement linked to Emir Abd el-Kader. The town is also the headquarters of the Tea Party Patriots of Northeast Iowa, and in a delicious twist of fate Elkader's only two Muslim residents are an openly gay couple who run Schera's Algerian American Restaurant on Main Street. On An Overgrown Path is no longer linked on social media. New posts are available via RSS/email by entering your email address in the right-hand sidebar. Any copyrighted material is included for critical analysis, and will be removed at the request of copyright owner(s).